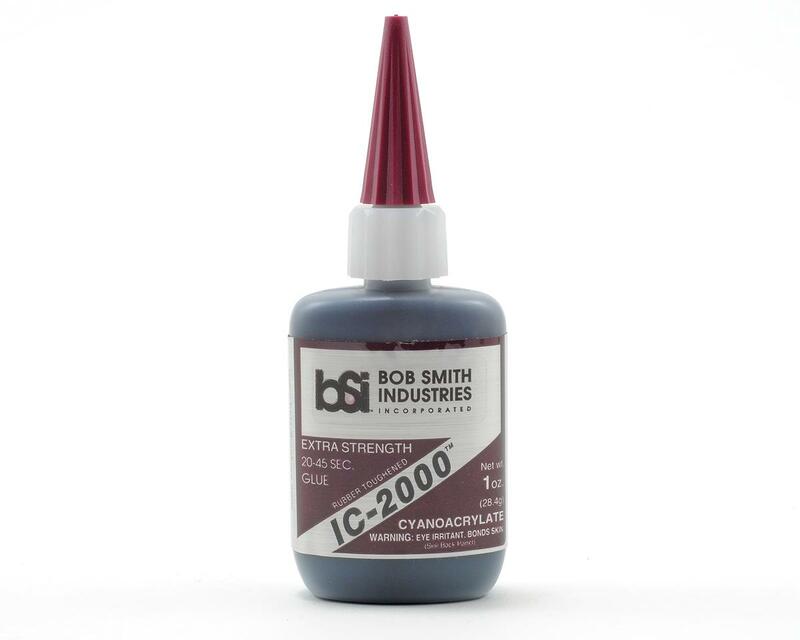 This is a one ounce bottle of Bob Smith Industries IC-2000™ Rubber-Toughened CA Glue. IC-2000™ is a rubber-toughened cyanoacrylate that forms superior shock resistant bonds on non-porous surfaces. The black colored CA has added flexibility for the bonding of metals, fiberglass, rubber, carbon-fiber and other advanced materials. For model use, IC-2000™ is ideal for the bonding of bulkheads, formers and servo rails to the inside of fiberglass hulls and fuselages. Setup time is 20-40 seconds, which can be accelerated with INSTA-SET™. When cured, IC-2000™ is pliable enough to be carved with a hobby knife. IC-2000™ is the best adhesive for R/C car tires. This is the strongest adhesive I have ever used on RC car tyres. I found it takes longer to cure than standard CA so there is time to work it around the tyre bead. You need to be using black rims though. If you use your tires for more than a few races this is this go. I have not seen any other glue hold the side wall of the tyre bead, this can. Tyres can still be removed from rims with acetone.